NANJING, Dec. 29 (Xinhua) -- China's first domestically-designed modern bridge over the Yangtze, the country's longest river, a national landmark, reopened to road traffic Saturday after a 26-month renovation. As the first double-decked road-rail truss bridge designed by China, the Nanjing Yangtze River Bridge in the eastern city of Nanjing first opened to traffic on the same day 50 years ago. During the renovation, the highway traffic on the upper deck, which is 4,589 meters long and 15 meters wide, was suspended while the railway on the lower deck, which is 6,772 meters long and 14 meters wide, was not disturbed. In the three days before the official reopening, the bridge was opened to the public, attracting 200,000 visitors. "We were so proud of the bridge when it was built," Nanjing citizen Liu Yong said. "The bridge displays Chinese people's innovative spirit, which should be inherited by the younger generations." "The bridge is a collective memory for generations in Nanjing and other parts of the country as a symbol of technological achievement, the spirit of teamwork and a sense of pride," said Lu Andong, a professor with the school of architecture and urban planning at Nanjing University. "For most Nanjingers, the bridge is not only infrastructure but a symbol of the nation's self-reliant spirit," said Luo Jian, who is the same age as the bridge and has been its maintainer since 1985. Luo's father Luo Binfeng, 83, was a constructor and maintainer of the bridge. After taking part in the construction of China's first Yangtze River bridge in Wuhan, he joined the building of the one in Nanjing in 1959, which was then an urgent aspiration of the people and nation. "It was no easier than the first due to difficult geological, economic, and technological situations," said the father. An American bridge engineer asserted in 1937 that it was impossible to build a Yangtze River bridge in Nanjing for hydrological complexity and poor geological conditions. Even so, construction of the bridge officially started in 1960, with no foreign experts' help, relying solely on China's own bridge construction experience and firm determination in self-efforts. Workers and engineers spared no efforts to ensure construction quality, with the bridge's height and depth once being regarded as engineering miracles. The bridge also made it into the Guinness Book of World Records as the longest bridge with dual highway and railway functions. However, after 48 years' in service, there were large cracks on the cement road surface, and ornamentations and drains need to be renovated as well. To enhance the safety and durability, China's top planning agency approved the repairs in 2016. The renovation, with an investment of 1.14 billion yuan (166 million U.S. dollars), has replaced the concrete highway bridge deck with a lighter and more smooth steel deck. The sidewalks are also wider. "Although renovating is not as difficult as the building half a century ago, a lot of advanced technologies were used," said Chun Qing, an associate professor from the school of architecture in Southeast University. The bridge is equipped with fiber optic sensors, similar to medical cardiograms, to help dynamically monitor its structural health. "We have put about 100 sensors to monitor the real-time damages to the bridge," said Zhang Jian, a professor from the School of Civil Engineering in Southeast University. To keep the original appearance, the renovation team also used 3D scanning technology to restore one missing iron relief damaged by a vehicle crash in 1991. The bridge, which connects the No. 104 and No. 312 national highways, was the first major cross-river passage to help connect Beijing, the national capital, and Shanghai, the business and financial center. With decades in service, the bridge is already a witness to the technological advancement of the railways and economic development of the city and even the nation. "The designed speed of the railway was 60 kph at first and now trains run up to 140 kph," said Luo Jian, adding the daily road traffic flow had reached between 80,000 and 90,000 vehicles before the renovation, about ten times the designed flow. 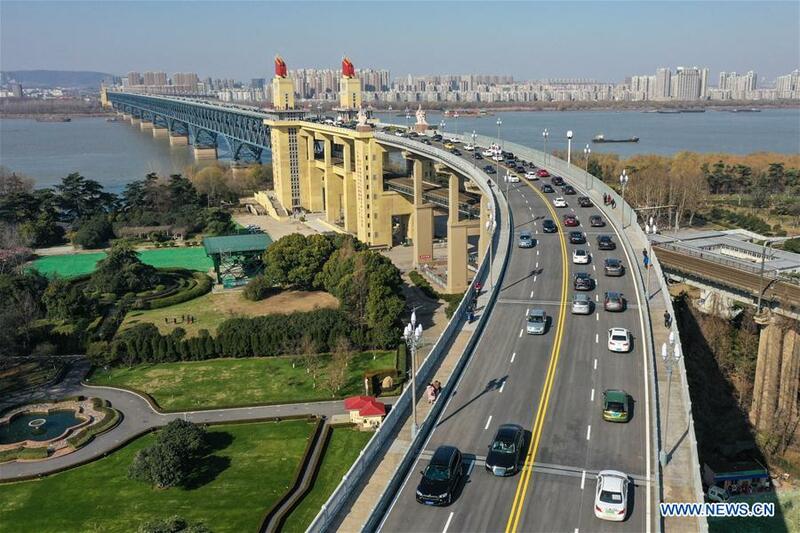 The improved transport benefits Jiangsu's first National New Area, set up on the north side of the bridge in 2015 and home to high-tech firms in new materials, biological medicine, and intelligent manufacturing. To cope with rising demand for cross-river road transport as well as high-speed railway lines, Nanjing has built another four bridges over the river with the sixth under construction. High-speed trains ran across the bridges up to 300 kph. "The Nanjing Yangtze River Bridge, however, will continue to be a major passage in the next century, expecting to connect a number of high-speed railways on both sides of the river," said Yang Tao, president of the Institute for Urban and Transportation Planning and Design in Nanjing. "With repairs and maintenance, the bridge is expected to be in safe operation for another 100 years," said Guo Jian, deputy director of the Center of Public Project Construction in Nanjing.